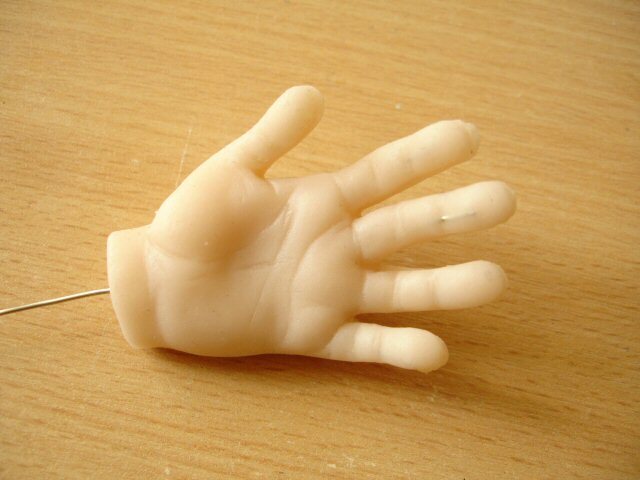 Here is a relatively easy method of modelling and casting puppet hands for stop-motion animation, with the wire armature encased within the silicone cast. It is quite satisfying .. and quick! .. because in a sense all processes are carried out concurrently, and also the silicone used is a very fast-setting one. 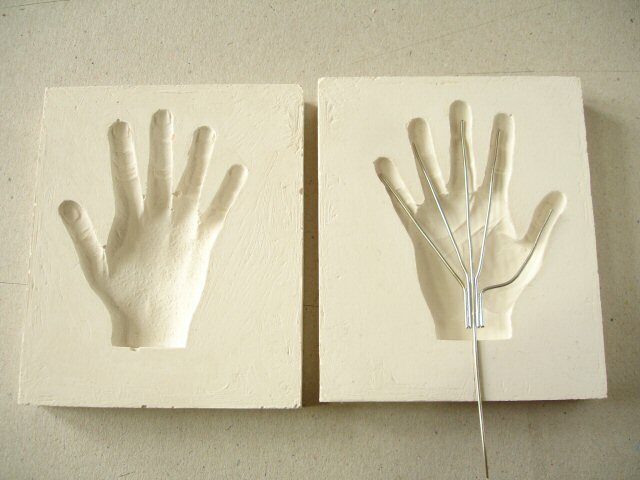 Firstly the method involves modelling the hand prototype in two halves. Above, I used my own hand as reference, drawing round it to get an outline guide then reducing that on the photocopier. I then traced that outline onto a Pvc board and modelled the palm side half of my hand in Super Sculpey. 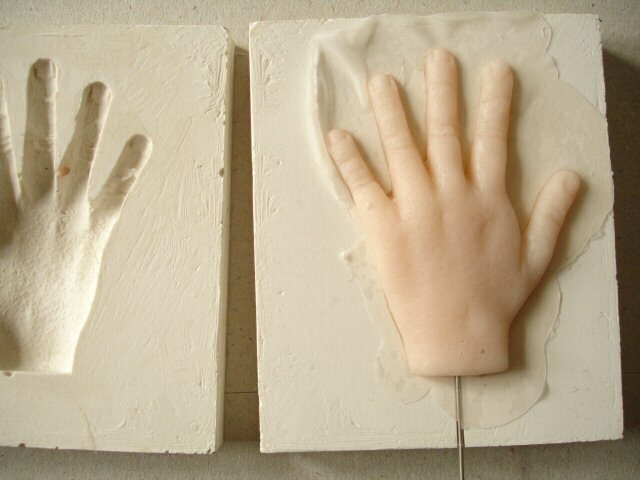 The challenge with this method of modelling is that the two halves of the hand are modelled ‘blind’ of each other, that is, first one half modelled and one half of the mould made, then the setup flipped over to model the second half directly onto the first. It means you have to hold onto a very clear idea of exactly where you’ve placed the dividing plane, otherwise fingers can easily become too thick. The solution of course would be to define that in a side-view drawing, although with hands this is not as easy as it might at first seem. Super Sculpey is a soft, versatile polymer clay which is used extensively in film for the modelling of character maquettes etc. It is by far my favourite modelling material because it can be conditioned (prepared, in this case by working between the fingers etc.) to a very soft state without it sticking at all to fingers or tools. There is also no hint of ‘push back’ when modelling it. In this respect it’s similar to a good quality soft modelling wax, with the advantage that Sculpey can be baked hard if required. Here there is no need for that since the flat form is supported. I’ve used Pvc for the baseboard because the Sculpey sticks quite well to it (enough to stay in place) and it needs no barrier against the plaster poured onto it. 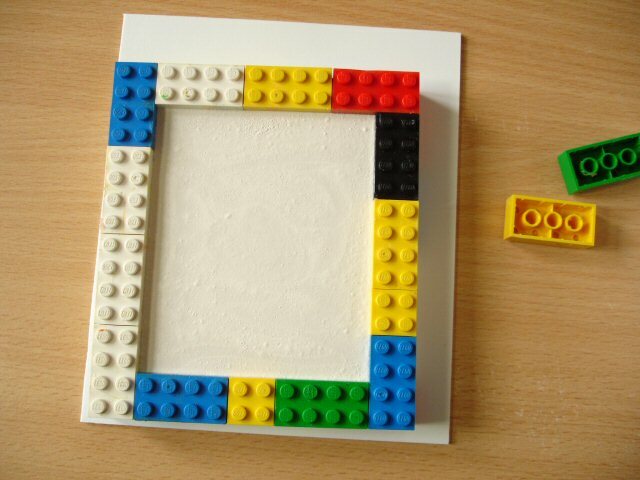 Next a quick mould wall is built using Lego ( a common practice in commercial small-scale mouldmaking). The wall is built up to at least one brick higher than the highest point on the prototype. Although neither baseboard, prototype nor Lego need any barrier against the poured plaster, it is a good idea to Vaseline the inside Lego surface to prevent the plaster from seeping through the cracks, especially if the Lego has been often used. Similarly the Lego needs to be fixed to the baseboard with masking tape around the outside (not visible in the photo). I have used a fine, hard casting plaster called Prestia Expression from Lafarge (available in the UK through specialplasters.co.uk). This will take the detail of the hand well. I mixed it to the thinnest possible consistency and poured it directly over, tamping (knocking the side of the mould) continuously to eliminate air bubbles. One can if one wishes brush a coating of the plaster onto the hand first, making sure that all details (such as the spaces between the fingers) are properly filled (tamping as before) before pouring the rest. ‘Alpha’ plasters (denoting the finer, harder kind such as Prestia Expression or British Gypsum’s Crystacal R) can be safely demoulded in well under an hour. I prefer to wait a full hour just to be sure. I released the setup by stripping off the masking tape first then twisted a little before removing it from the baseboard to ensure that the Sculpey hand came cleanly with it. 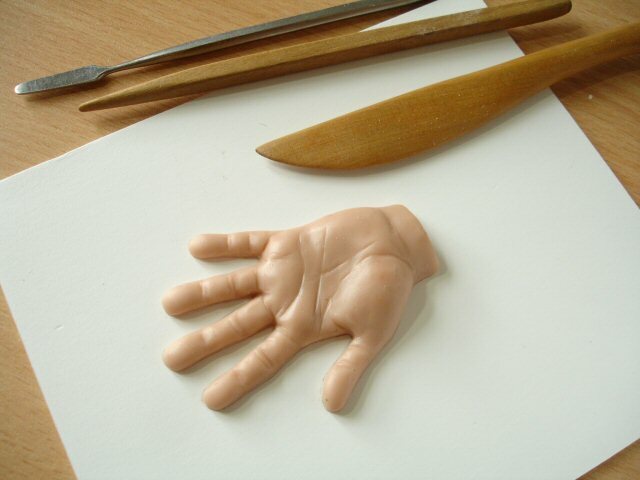 The second half of the hand can then be modelled directly onto the first. The Lego wall should remain where it is. It may be better to tape round it to ensure that it stays. 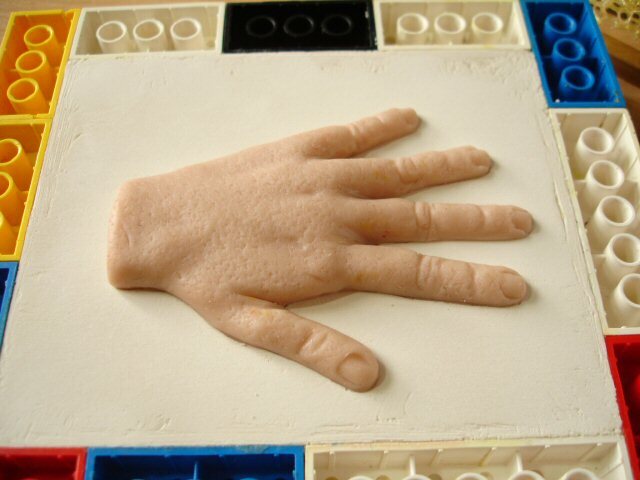 I used a piece of open-celled foam, called reticulated foam, pressed lightly into the Sculpey to create a slightly rougher texture for the back of the hand. The fingernails are also achieved easily by impressing a flat tool. Below, the Lego wall now only needs to be added to and .. most crucially.. the plaster surface Vaselined before the second plaster half of the mould can be poured. If I’d wanted the two plaster mould halves to lock together in the right place each time I would have cut or drilled countersink depressions in the plaster which would create corresponding pegs on the second half. I decided not to do that in this case because I wanted the option later of sliding rather than pushing the two mould halves together. While the plaster is setting the wire armature can be made, as shown below. I have used a 1mm thick tinned copper wire, which is easy to bend repeatedly. The tinning also means that the pieces can be soldered together strongly with regular tin/lead type solder. Soft aluminium wire is usually recommended for puppet armatures but I’ve found that this type of copper wire works better at the fine gauges needed for hands. Aluminium wire is also more difficult to solder successfully and requires special solder and flux. 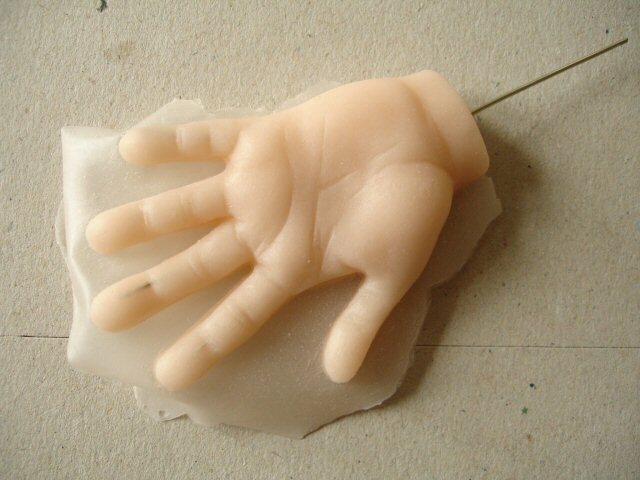 The armature is designed to be set into a groove carved in one of the mould halves which will keep it in position within the centre of the hand. 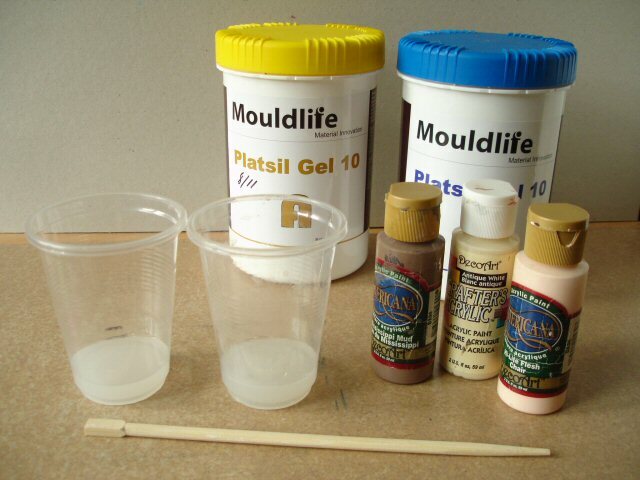 Plaster is ideal as a mould when using silicone as a casting material. Although porous the slightly powdery surface of plaster serves as a natural release agent against the rubber. Since silicones are not affected by moisture while curing (unlike resins) the plaster moulds can be filled almost as soon as they’re set. Plaster is not so often considered as a mouldmaking material anymore (except for slip casting) because of its inflexibility, but if the cast itself is to be flexible it makes no difference. However, plaster may not be so suitable in reproducing very small forms or preserving especially fine detail. In these cases it may be better to make the moulds from silicone instead. Although normally any silicone would stick to another, thoroughly Vaselining the mould will prevent that. Alternatively a release spray can be used (such as Pol-Ease 2350 or 2500) as long as it’s not siicone based. 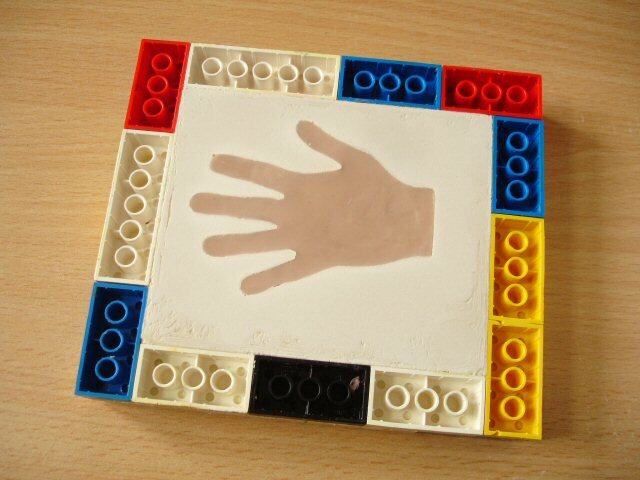 Enough silicone should be coloured and mixed to fill both halves of one hand. 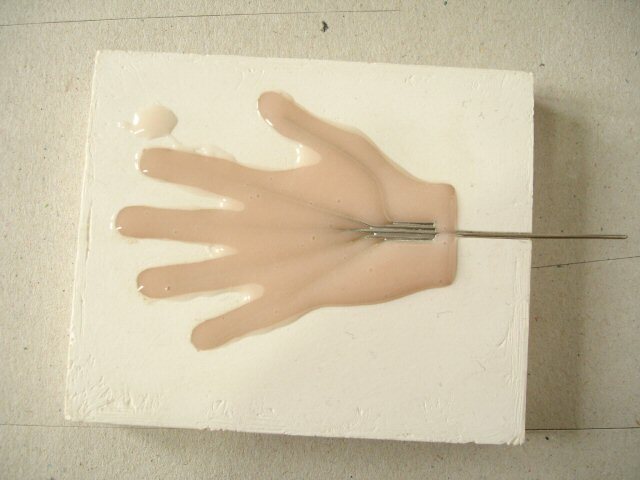 It may not be possible to cast both hands at once in the few minutes available especially if adjustments are needed in the positioning of the armature. In order to have the same colour for both hands you would need to estimate how much of part A (or B) is needed in total, mix the pigment in and keep half of it aside for later. Platsil Gel 10 is not exactly ‘pourable’ since it is quite viscous. It needs to be assisted into the mould form using a stick to spread it around. The two mould halves were quickly filled until slightly proud of the brim, the armature put in position and then the two halves pressed tightly together. After about half an hour the mould could be taken apart. 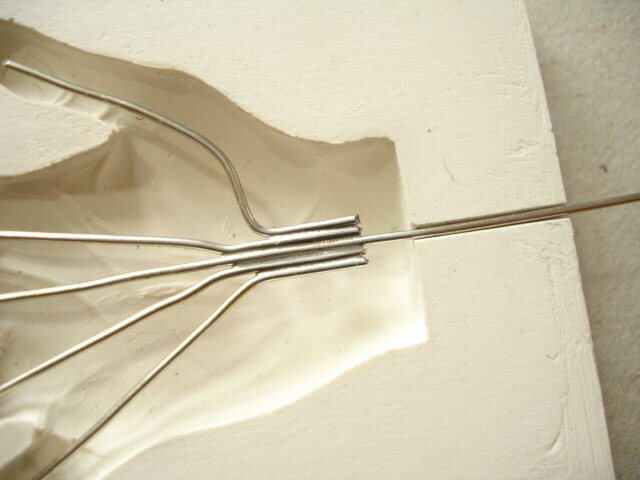 Below, the armature has moved a little too close to the surface of one of the fingers. This can be fairly easily patched over.. but it is not meant to happen. It may take a bit of practise. The surplus which had been squeezed out can be best removed using small scissors. This entry was posted in casting, modelling, mouldmaking, stop-motion animation and tagged 2-part modelling, casting in silicone, colouring silicone, plaster moulds, Platsil Gel 10 by david neat. Bookmark the permalink. 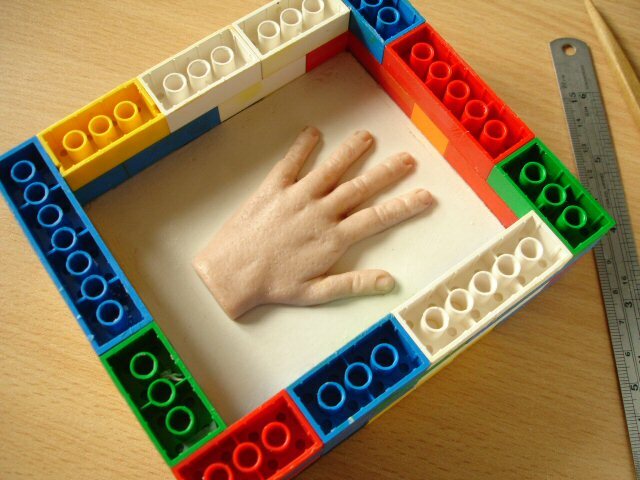 I am looking for someone to build a large quanity of these hands for a trade-show display. Would you have any recommendations? My only advice at the moment is that you get in touch with 4D .. modelshop.co.uk .. who might be able to help. Sweet, I am going to try this method for my astronaut monkey characters space gloves. Different parts could be paint brushed different colors maybe with a mixture of latex and paint? I’ve learnt a bit more since I wrote this .. the only ‘paint’ that will stick to the silicone surface is either one you make up yourself using a little of both parts of the silicone plus either acrylic or powder pigment thoroughly mixed .. or special paints you can obtain from prosthetics/special effects suppliers. Nice post! I’m giving this a shot for my college final model making project, only doing the full body. I might need to cast the head separately or possibly make it into a 3 or 4 part mould as the head juts forward. Very useful. 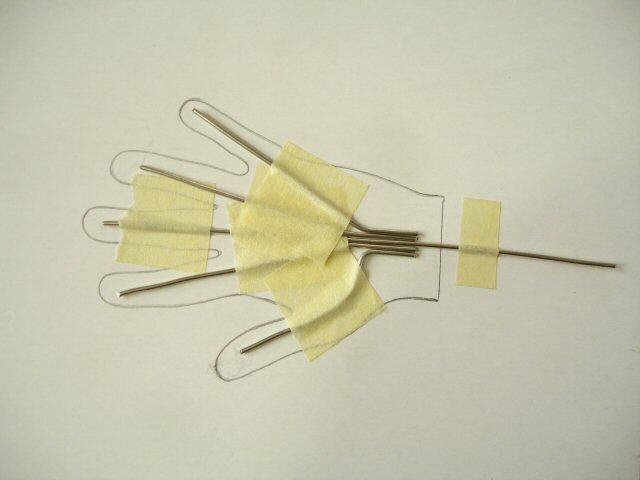 Can you use copper wire armature for the hands if the wire is not tinned? Yes you probably can, it’s just that the tin coating makes it easier to solder I think. Also because the copper is darker in colour it might show up more underneath the ‘skin’, but if so you could paint it before inserting it. Thank you! Now I can use that roll of copper wire that I’ve been saving for some unknown reason. I bought your book a while back, this blog is an incredible inspiration to me !!! Thank you !! Great tutorial! I’ve always found it hard to cast hands but these look very professional. I will definitely be using this method in the future. I will also have to check out Platsil Gel 10 silicone.